As we gear up for the start of term, its time to think about how to handle that first class session with a new group of students. Here’s a game that teaches students where to find key locations on campus and how to create a customizable map via Google Maps. Its great for the first day for a class of first-years, particularly if you are teaching a first-year seminar or other mixed group class. It was created by my colleague, Ralph Olliges, after he attended an ALPS team seminar on simulation and game design. Feel free to customize to fit your needs, and as always, hit the comments to share your experience if you use this! An example of a customizable map. Clicking on a location icon will bring up the associated photo. Number of students: 3 on a team. Find value in cooperation of others. Game Description: Groups scan an instructor-created QR code (free at a site like this one) and find the locations of where they need to go on campus. At each location, following the directions below, they take a group photo and upload it into a google maps location they create. Teams then share their customizable maps with each other and the instructor, earning points for the # of locations found in the given time and the speed and efficiency of their map creation process. You have one hour to find as many locations as you can and then share your map. One person in the group needs a smart phone with a QR code reader app on it. Scan the QR code to find the list of locations on campus where each team must assemble and take a photo. Assign each member of the team a letter: A, B, or C. Before you start, person C texts or emails the instructor the list of the team members and their assigned letter. Go to each location on campus. One person takes a picture of the other students in the group. No selfies allowed except for the last one. A different person must take the picture each time. You may use one camera. See the list of locations to see the person assigned to take each photo; this is to ensure that groups stay together. The pictures may be taken in any order. The students in the photo must have a sign with the letter of the person taking the picture. 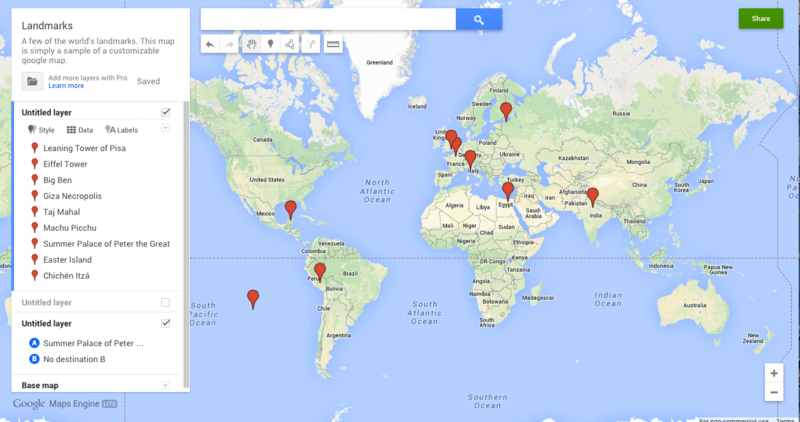 The group then creates a customizable google map with all locations, using these directions. In Step 9, each group must attach their photos to the appropriate location. Once all locations are found, or as many as can be in the time allotted, groups must share their Google Map with the instructor and their classmates. The team that shares their map 1st = 25 points; 2nd = 20 points; 3rd = 15 points; 4th = 10 points; and 5th = 5 points. Library reference desk. Person A takes the picture. Academic Resource Center. Person B takes the picture. Fitness Center. Person C takes the picture. Business Office. Person A takes the picture. Student Government offices. Person B takes the picture. Health Services center. Person C takes the picture. Cafeteria. Person A takes the picture. Campus landmark (flagpole, statue, etc). Person B takes the picture. Faculty member office. Person C takes the picture. A picture with a University Administrator . This is the only selfie picture allowed, as the whole group must be in the photo. *The original version of this game has students simply email the photos to the instructor, rather than creating a map. If you are less interested in the create-a-map portion of the activity, that can be easily dropped in favor of the email method.